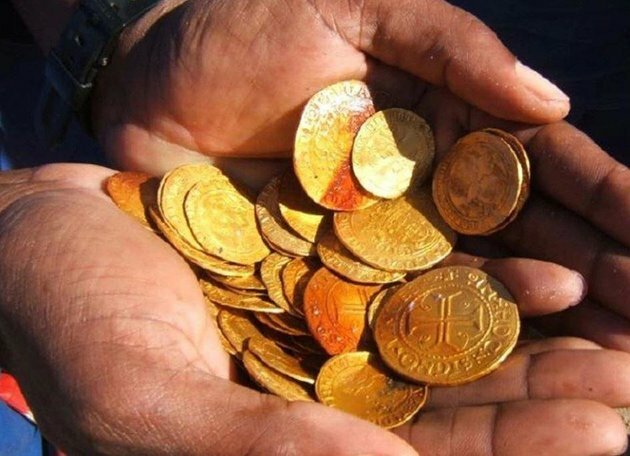 Perplexed diamond miners working off the coast of Africa stumbled upon a treasure; a 500 year old shipwreck loaded with gold worth a whopping $9 million. The ship is appropriately named Bom Jesus; meaning Good Jesus, as it is nothing less than a miracle from the supreme up above as described by the miners who made the monumental discovery. The ship was first identified and discovered by the geologists working for the mining company De Beers; the geologists discovered the ship off the coast of Namibia near Oranjemund in April 2008. The ship belongs to the Golden era of Portuguese sailors and explorers who set sail in all directions in search of new lands to colonize and capitalize from. The Bom Jesus left Lisbon sometime in 1533 under the supervision of Sir Francisco de Noronha, but on its way to India the ship simply vanished without any trace and with its precious cargo was lost. This was not the only wreckage discovered by the miners from the site; a number of others discoveries were also made near the region. The miners were conducting a challenging task to drain an artificial salt lake and as the lake dried out many lost ships were found lying at the lake bed. However Bom Jesus was the oldest. The discovery was not a sudden event; the miners first found many strange pieces of the ships and other old artifacts lying on the beach. The actual treasure was found once miners dug the sand and unearthed the remaining part of the ship buried under tons of sand. 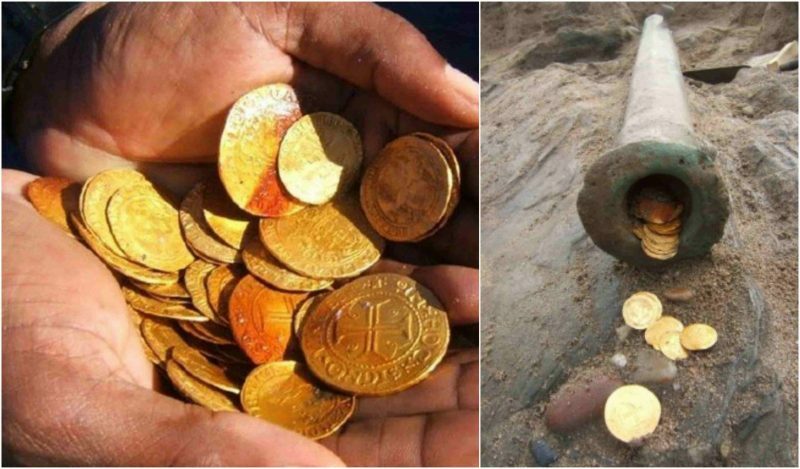 From the day the miners found the initial signs of shipwreck scattered along the beach, it took them a whole week to put their hands on the gold coins and ivory tusks; six long days of digging and unearthing finally paid off in the form of a massive treasure trove. The discovery of Bom Jesus is hailed as the most significant shipwreck of all times due to its age and the plethora of gold it contained on board. The site has earned a position on UNESCO Convention on the Protection of Underwater Cultural Heritage. The treasure of Bom Jesus contains a whole variety of different items from many countries and places around the world. The cargo on board Bom Jesus contains Ivory from West Africa, Copper ingots of German origin, gold coins from Portugal, Spain, and Venice. A plethora of silver coins, weaponry including knives and high-quality swords also form the treasure along with personal belongings of the crew and some skeletons of the perished men. 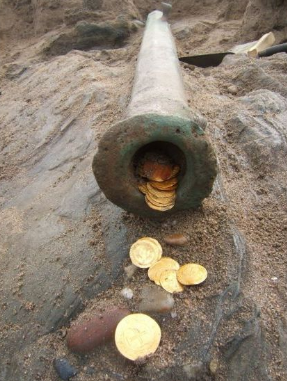 Other items found among the ruins include some astrological tools, musket compasses, some bronze bowls and long metal poles that were used in the ship’s structures. 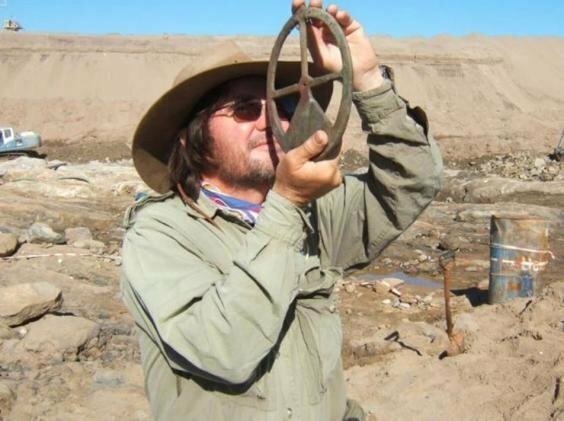 According to the reports from the archaeologist Dr. Dieter Noli, the Namibian government is going to keep the gold as the treasure was discovered technically within its borders; it is a standard process if a shipwreck or a treasure is discovered near the beach i.e. the spoils go the country which owns the beach. A twist in the rule is that if the ship containing the treasure is identified to carry the flag of a certain nation at the time it sank; then the remains automatically go to the country whose flag it was bearing in its last moments. However, Portugal authorities showed immense generosity and stood down from its right over the treasure and allowed the Namibian government to keep it.